Nanchong of Sichuan Province, a warm disasterless place,is the main production basis of silkworm.Jialingjiang River, which is the major branch of Yangtse,flows the rich area.So much railway, thruway and air lines link with other commercial cities such as Beijing,Shanghai,Guangzhou,Chengdu and Chongqing.Very convenient to outside from here by train,by water and by air. 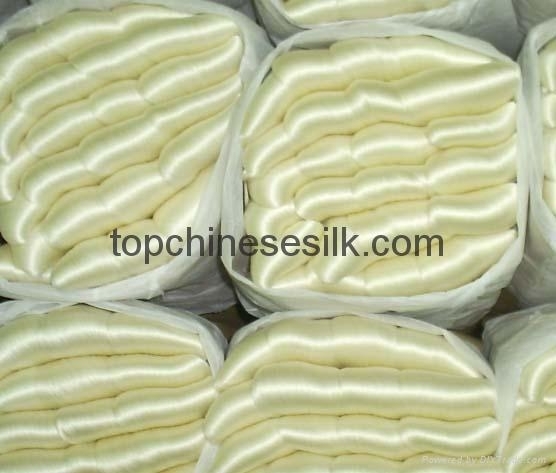 Being a professional worldwide supplyer,TopChinese Silk Industrial Inc specializes in silk yarn,silk fabrics and home textile fabrics with extra width.TCS is very serious in business,and belives the credit standing and quality is the most important. We're seized of a formidable producing ability with various weaving machines. 1st. 600sets of tradintional power loom are running. 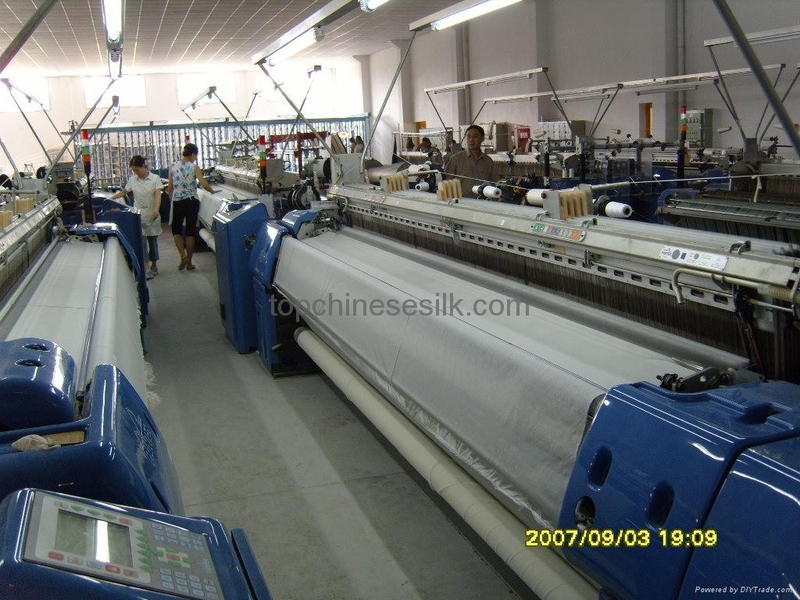 The effective unit weight of silk fabrics made by power looms is intervenient 3.5m/m-27.0m/m,and the effective maximal width 63" with smooth soleveges. made by rapier looms is intervenient 7.0m/m-43.0m/m,and the effective maximal width 141" with un-weaven selvedges. 3rd. Jacquard Rapier Loom is running.Please contact us without delay if you are interested in this kind of Jacquard fabric with large designs. TCS deals in silk items as follows. 2nd. 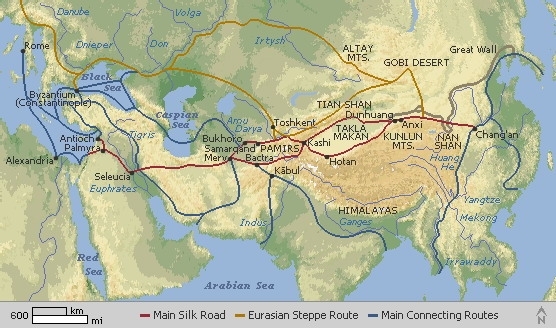 Silk fabrics B.O. – Doupion,doupion satin,habotai,crepe satin,crepe,georgette,krincle georgette,pongee,chiffon,silk twill,hanbok jacquard, heavy silks,lycra silk fabrics and so on,all are made by power looms with different width 25"-55". 3rd. Silk fabrics in plain dyed – dupion,dupion satin,habutai,crepe satin,crepe,georgette,krincle georgette,pongee,chiffon, silk twill, heavy silks and so on,all are made by power looms with different width 35"-55". 4th. 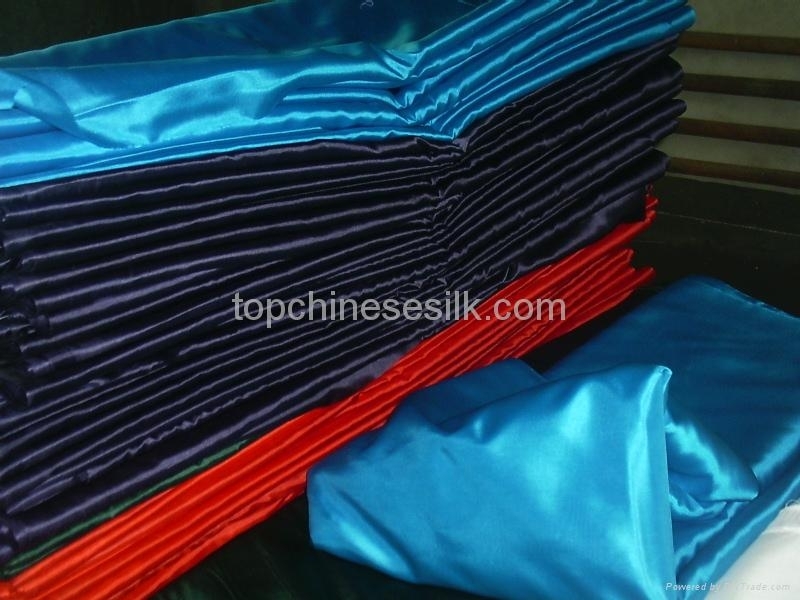 Yarn-dyed kinds – doupion,doupion satin,silk taffetta,satin,organza,crepe,georgette,krincle georgette,chiffon,silk twill, heavy silks,silk blended and so on,all are made by power looms or rapier looms with different economy width 40"-140"
At same time,we also produce various kinds of fabric with extra wide width. 1st.Raw weaving kinds - doupion,doupion satin,habotai,satin,reversible satin,crepe kinds,crepe georgette,georgette,silk twill,lycra silk fabric kinds,etc.. All are made by rapier,width 59"-141". 2nd.Yarn-dyed kinds - doupion,doupion satin,satin kinds,organza,silk taffetta,silk blended,in solid or checks and jacquard with large designs,made by rapier looms,the maximal width 141". For your different orders,we're willing to supply the cost-efficient quality goods to safeguard our buyers' profit.